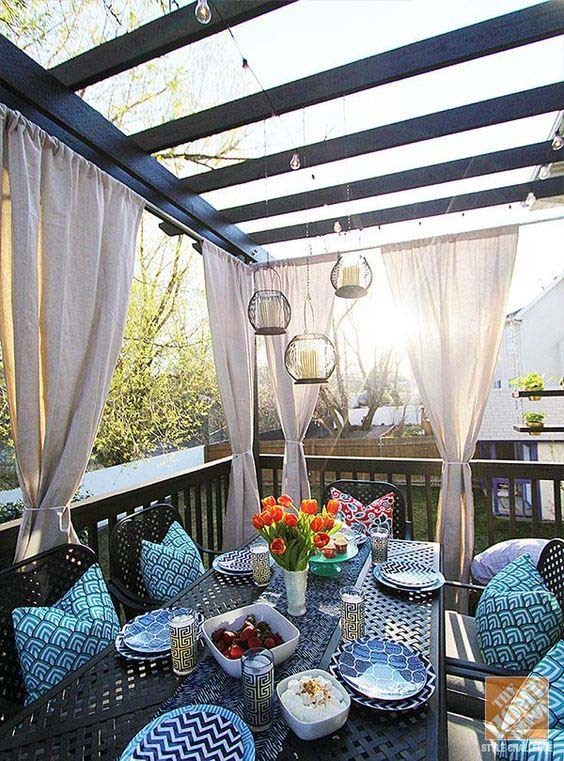 Outdoor living is a must, the Internet insists. 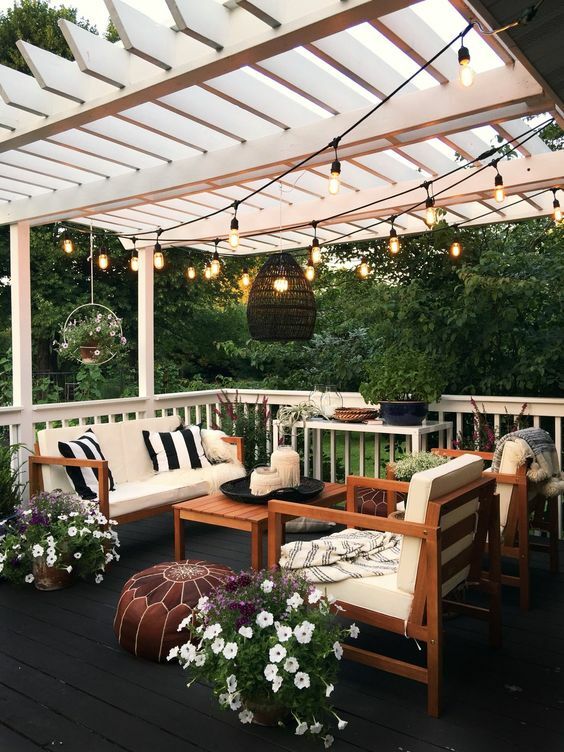 If you have a garden with a pergola, then you surely believe that, and are well-accustomed to the idea of living the open spaces of your home for a nice get together for the family, a romantic dinner, or just some quiet time alone with an interesting book. 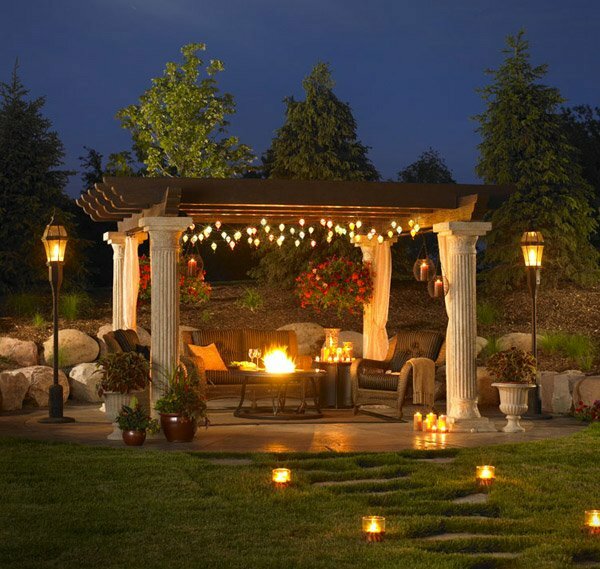 As the weather gets warmer and the nights also become a nice time to be outside, it is a complete waste to overlook the possibilities of lighting your pergola so that you can enjoy your garden after dark. Here are some exciting ideas how to create a mesmerizing spot to spend time at in your garden with just a few cables and bulbs. 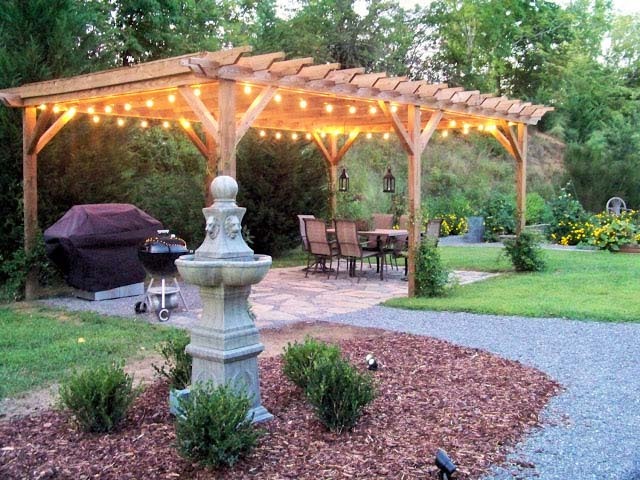 Pergolas are great to spend time just outside the comfort of your home. A nice activity to share with friends there is barbecuing. 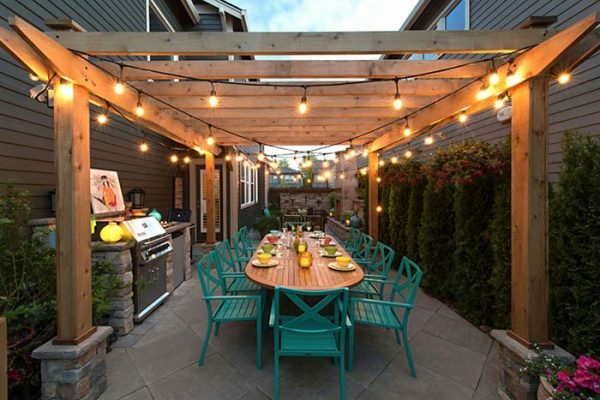 The pergola in the picture has some relatively strong lights at its disposal if only to provide safety when people try to approach the grill. Also, the yellow light complements the brown furniture, making it look rich in color. Lighting should be enough to make outdoor activities possible and not too much, because you wouldn’t want to feel as if spending time indoors, in a brightly lit room, nor under the sun on a hot day. That is why most people would go for dimmer atmospheric look. But there is also another thing to consider: furnishing. 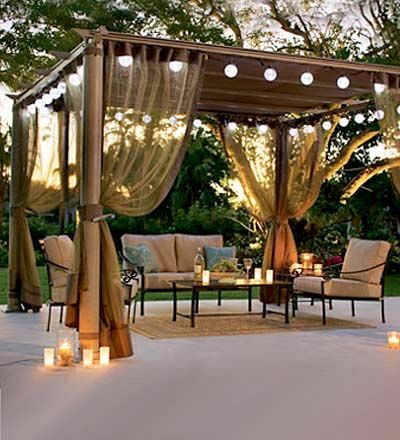 Your pergola can have a variety of decorative elements such as curtains or pillows in it, and matching the lights to the style of everything else brings it to a new level. Unique pergolas like the one shown here stand out easily. So much that at first glance you may even not notice the swimming pool or the modern design of the house itself in the background. Of course, for a great style you (or your exterior designer) need to exceed yourself when placing lamps, because you want to enhance and not diminish the effects. Spotlights and a fancy metal chandelier add much in that aspect. Multi-colored Christmas lights are a great decoration for the winter season. 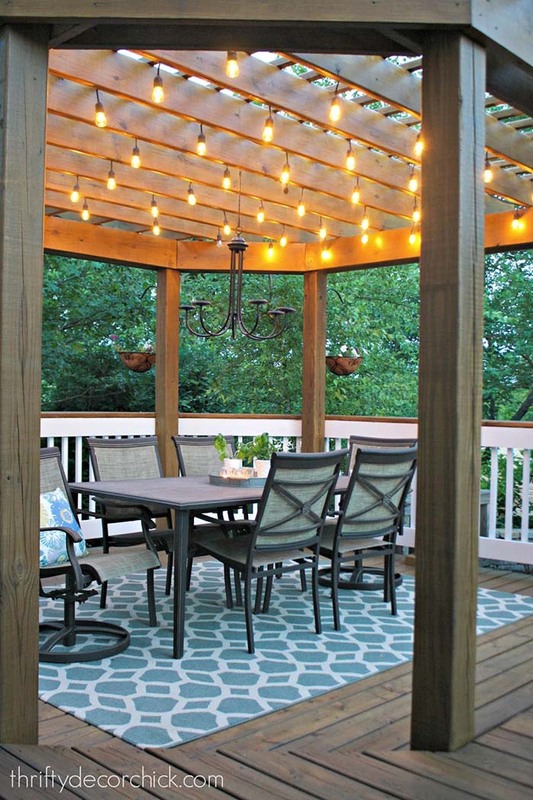 The lights used in this pergola lighting solution closely resemble those and can be also used in summertime. They don’t come with snowfall and merry jingles, but make up for that by giving you a cozy atmosphere for a family dinner and let you feel like opening presents. Low-wattage bulbs, if there are many of them, help you feel at an entirely new place. They are contemporary and easy to use yet do some great work towards establishing nice and calm atmosphere. 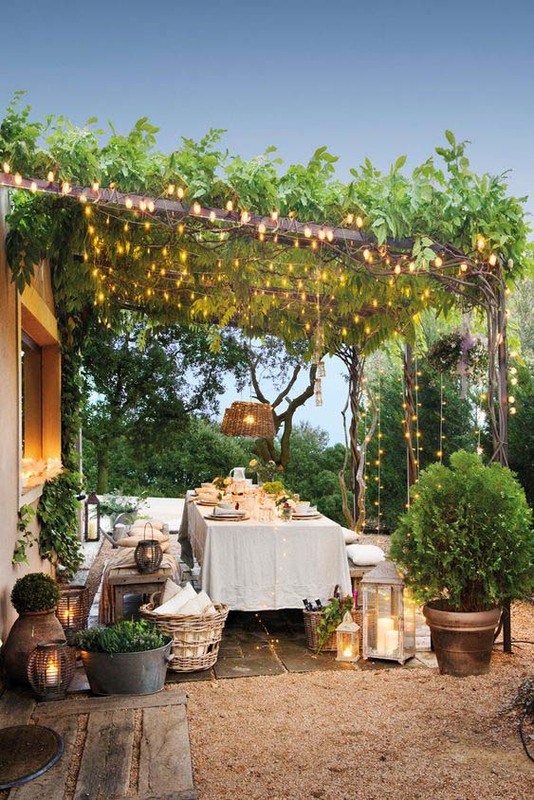 The visual element, which steals the show here are the lanterns on the ground leading to the pergola. They guarantee a safer walk when it is dark, but also add dynamism and the feeling of a special occasion. Also notice the candles, which light up the place beautifully and are a great romantic addition to the antique columns. 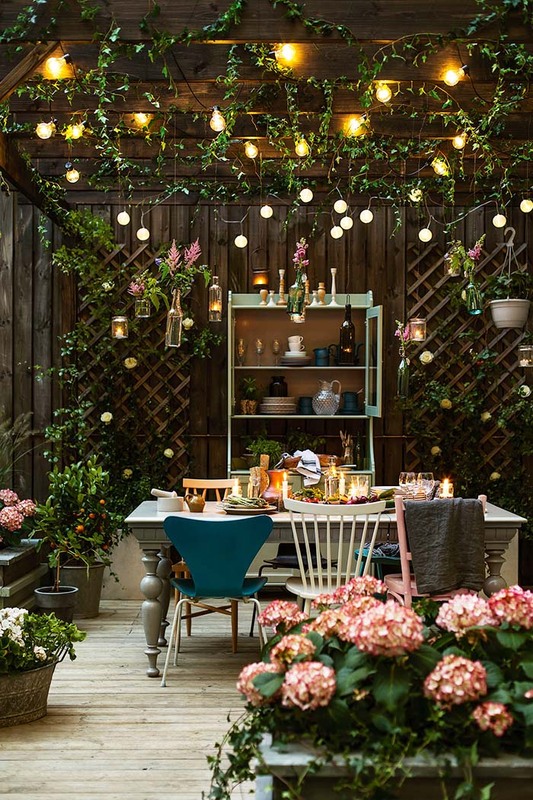 This pergola lighting idea is just a different reading of the one from above. But while the construction itself is nowhere near as impressive as the previous entry, the atmosphere is quite mesmerizing with great ambience created by several different lighting bodies, such as string lights, hanging lamps and candles under a covering sail. Light sources work better with some textured surfaces and luckily pergolas have a definite advantage over the indoors in that regard. The vines entering through the roof in this picture provide dynamic shadows and some natural beauty, which is enhanced by the number of hanging lamps. As much as people enjoy hanging, mounted, candle or lantern lights, sometimes it is just nice to have perfectly reliable and orderly lamps installed in the ceiling. The roof is not covered so good use of the beams needs to be made. The stone walls and modern looking furniture go hand in hand with that kind of lighting. 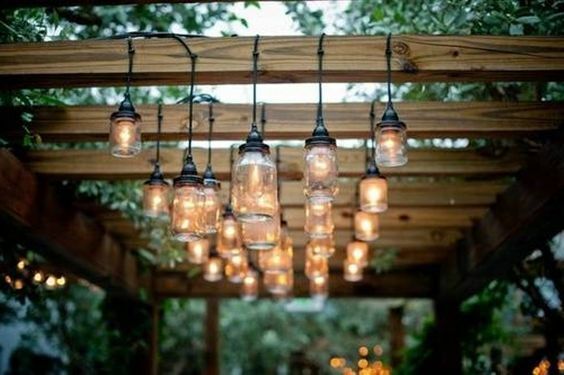 String lights are relatively easy to pull off, because you don’t have to think about attaching each lighting body separately. Just trace the cable from one end of the pergola to the opposite and check if their light reaches all spots where people would be sitting. The atmosphere is important, but so is safety, so make sure nobody will hurt themselves because they couldn’t see the exact location of their chair. If most of the suggestions above are not really your cup of tea and you can’t imagine yourself playing with many cables without getting fed up with it, here is a solution for you: just one lantern in the middle to give light to your evening outdoor activities. 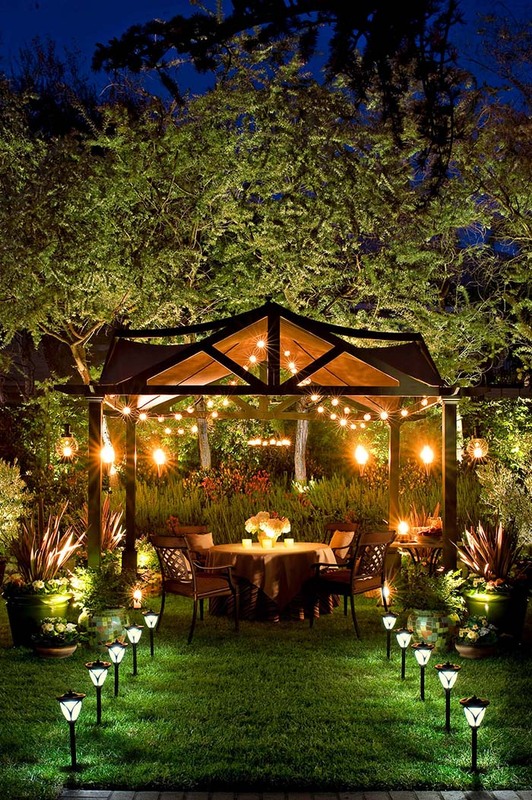 Pick the biggest lantern they have and make sure it is a pretty one: it will be easy to spot by guests and yourself. It could be an actual authentic lantern or an electric one. In case you need some more illumination, bring in a few candles, just in case. Want to feel at home? Well, then either candles are the way to go, or if you want to keep it classy, why not even a chandelier? The choice for people who want to feel fancy even in their garden. 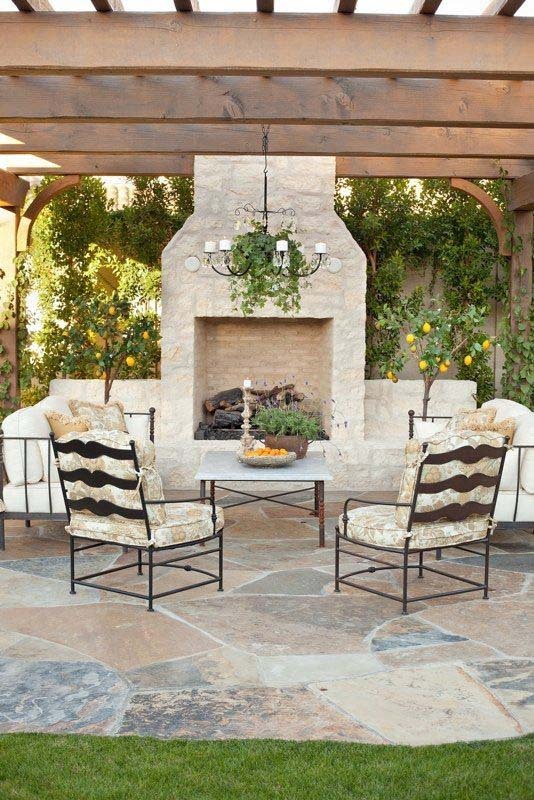 If the owner of this pergola starts missing the luxury of their house, they can always light up the fireplace. Pergolas which are built just outside the house don’t really need extensive illumination: a big lamp in the middle or a couple of smaller ones will do the job as you don’t need to also make the way there visible. The one in the picture is encased in glass to make sure it stays safe under challenging weather conditions. Yellow light lamps give a cozy dimmed atmosphere. In contrast LED-lights and spotlights are slick and precise. The lights here provide some extra light. The owner couldn’t really decide between natural and LED-light, so they also placed a bunch of candles to be able to have either of them at any specific time. The pergola here consists of a single table with a bench at each side. 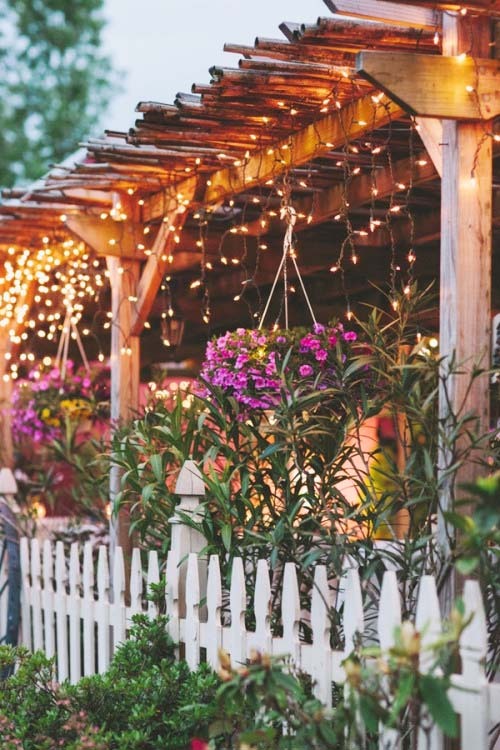 The string lights are hanged high, so they provide illumination, but still don’t shine too brightly and allow for a more intimate atmosphere. 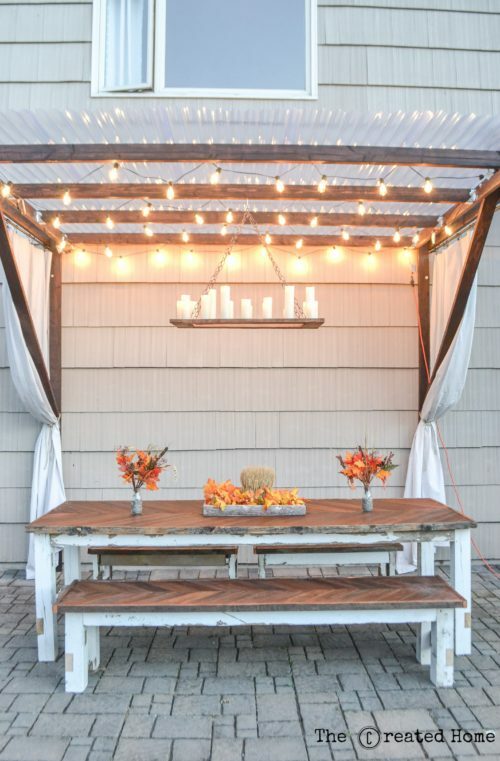 The purpose of this pergola is most probably to provide a romantic spot outside of the house, and not to host party, so the candles are another well-thought touch. These lamps are great, because they offer a variety of options. You can move them around and hang them high or low, according to the ambience you need. Their cool design reminds of jars where kids sometimes trap firebugs or a night full of stars, because the thick glass disperses the light and dims it slightly. The beams of the pergola roof are great at hiding the cables, so they won’t bother you in the evenings and especially not in daytime when you won’t need to look up. 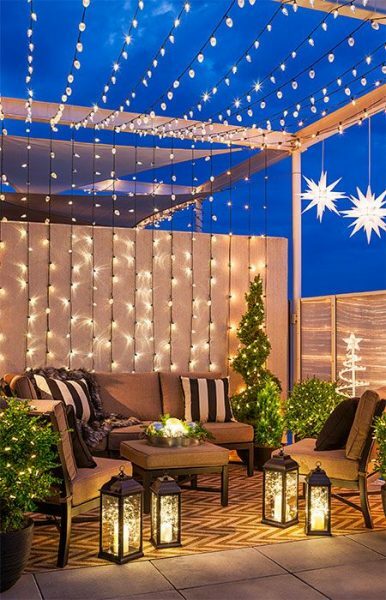 Before choosing lights it is useful to be aware whether you are going to use the pergola for quiet evenings with a loved one or for big noisy parties or family gatherings. 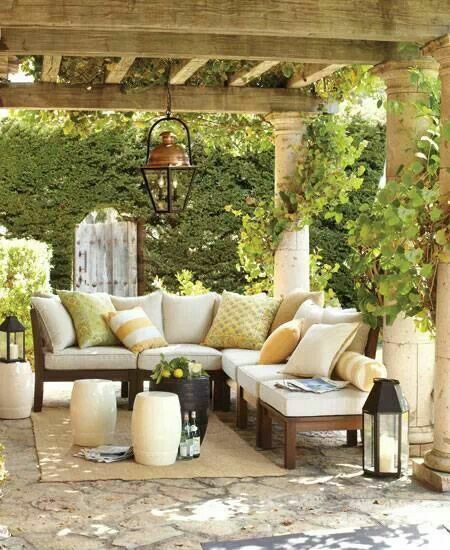 The type of pergola depends on that too, of course. In case you need something in between, this string light cover brings flexibility to the table. The yellow bulbs, which spread evenly over the big dining table speak clearly of a spot designated to family gatherings. They don’t give too little or too much light, but make it relaxing and fun for everybody present to walk around and find their spot at the table. The lamps also help the colorful chairs stand out as an accent. 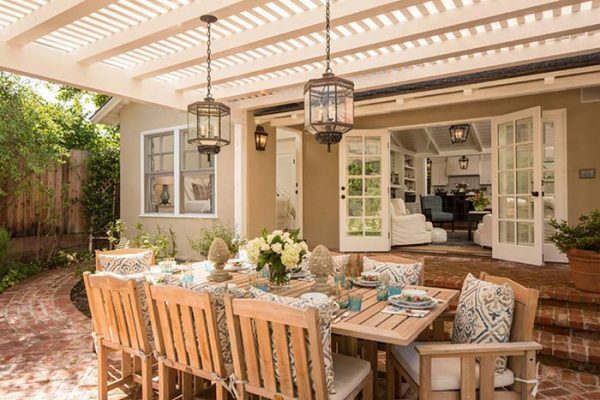 Here the pergola is an extension of the house: it shares the style and color palette and even borrows the chandelier/lantern style which can be also seen inside. This helps the owners enjoy the same comfort they feel at home, but in fresh air. 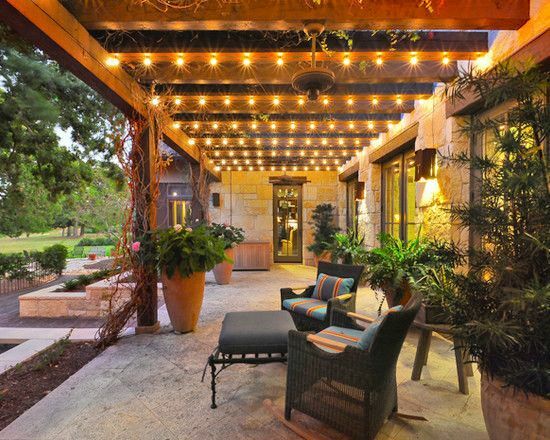 This exterior designer used ‘solar’ polar to light the evening, consisting of two decorative sun-like stars hanging from the beams. The string lights blur the lines between Christmas decorations and day-to-day lighting fixtures. 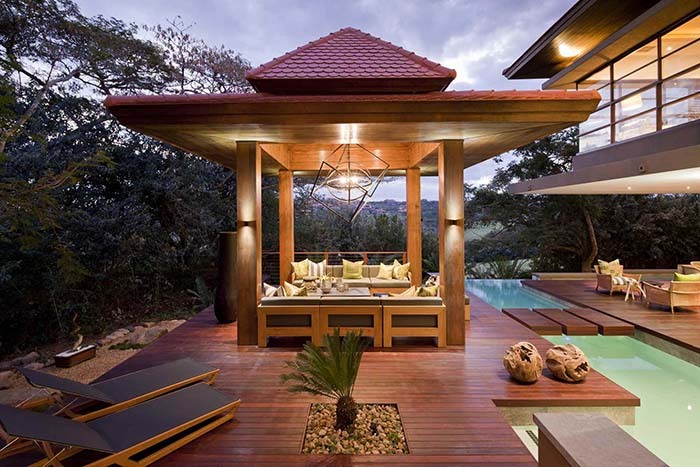 We don’t know which one the actual purpose of those is, but the pergola looks amazing nevertheless.